The LSPA Scholarship Fund will be hosting its 5th Annual Charity Golf Tournament on June 14, 2018, at the Highfields Golf Club in Grafton. LSP Association Scholarship Fund Now Accepting Applications! The LSP Association Scholarship Fund is now accepting applications for educational scholarships for the 2018-2019 academic year. The scholarship program supports continued education within environmental fields of study at colleges and universities throughout New England. Our goal is to provide two scholarships, each up to an amount of $5,000, to qualified individuals. One of the scholarships, established in 2007, honors the outstanding contributions to the profession of LSPA past president Jeffrey M. Hardin, and is awarded to an individual who is part of the LSP community. The applicant for this scholarship must be an LSPA member or an immediate family member of an LSPA member and enrolled in a degree program at an accredited New England college or university. The second scholarship will be awarded to a qualified Massachusetts resident who is enrolled in a Massachusetts college or university with a major in environmental studies. Please visit www.lspa.org for application information. Deadline for submission is Friday, April 20, 2018. The LSPA Scholarship Fund hosted its fourth annual golf tournament on June 14, 2017 at the Highfields Golf Course in Grafton, MA. We had a record of 132 golfers and everyone had a great time! Here is a link to the event photo album – please download and share your favorite images. All photography credits go to Thomas Barrasso. This year’s tournament filled up quickly and we had to close registration several weeks before the event. Please be sure to mark your calendars for next year’s tournament so you don’t miss out! 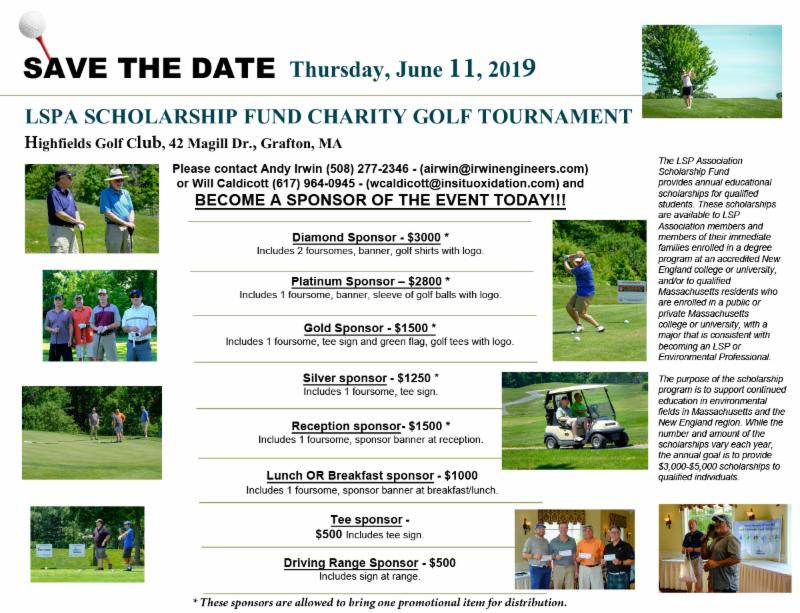 It will be held on Thursday, June 14, 2018 at the Highfields Golf Course in Grafton, MA. At the LSPA June Membership Meeting, four educational scholarships were presented by Bill Betters, President of the LSPA Scholarship Fund. The LSPA Scholarship Fund supports individuals pursuing undergraduate or graduate education in environmental fields in Massachusetts and other New England states. Since 2003, the LSPA Scholarship Fund has presented over 39 scholarships totaling more than $160,000. The LSP Association (LSPA) Scholarship Fund is pleased to announce that it will be accepting applications for educational scholarships for the 2016 - 2017 academic year. The purpose of the scholarship program is to support continued education within environmental fields of study at colleges and universities throughout Massachusetts and New England. Application information is available here. Sign up here to become a sponsor and to play. On May 29, 2014 the LSPA Scholarship Fund held its first annual fund-raising golf tournament. Originally conceived of at the annual Past Presidents meeting last summer as a means to raise a targeted amount of $3,500 for the LSPA Scholarship Fund, the tournament actually netted over three times that amount - $11,000 - for the Fund, which celebrates its 10th anniversary this year. Over 100 golfers enjoyed a beautiful day, a well-maintained course (Highfields in Grafton), and a hearty post-golf repast. Prizes were awarded for best-ball team scores and individual skill accomplishments, and a raffle stocked with both golf-related and non-golf related items allowed all the chance to win while supporting the LSPA Scholarship Fund. Photographs of the event, taken by LSPA member and professional photographer Tom Barrasso, are available here.